Garnered enough courage to do it finally: Slamming my old brick down in the weeds! After doing lots of reading on the subject, I decided to take the lowered path of cutting my springs on July 1st and managed to finish the project on July 3rd. A younger and fitter enthusiast might be able to accomplish the task in a day or over the weekend but I had hurt my knee (old injury), my back and fingers after struggling alone with the front suspension that I had to rest and recover on the second day. 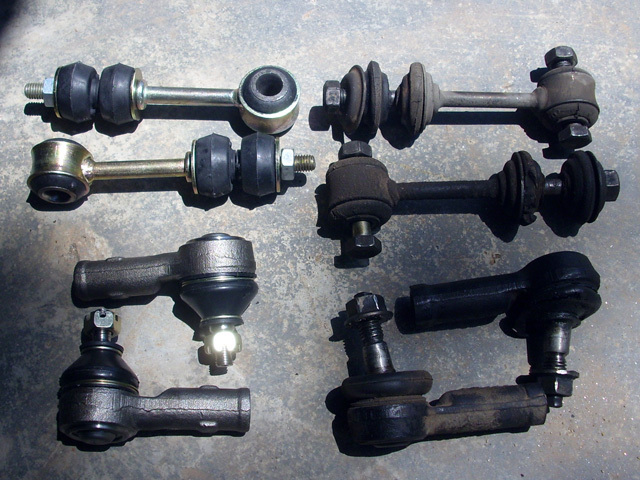 Tie rod ends and sway bar links. I had been doing some work on the front suspension over the past couple of weeks, replacing the front wheel bearings and the ball-joints. Next on the list were the tie-rod ends and the sway-bar links; and I thought I might as well do the cut at the same time as I would need to disconnect the tie-rod ends anyway. 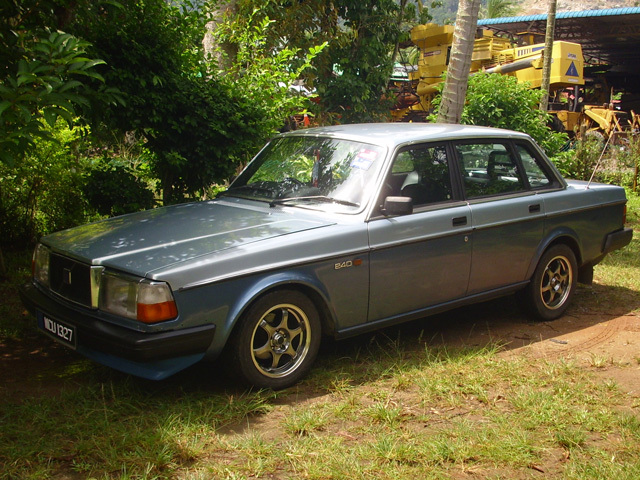 Thanks to Mr Crazychopsticks for his post on the Turbobricks Forum four years ago which I used as a guide for this project. As usual, there were special tools recommended. I did not have access to any of those so I had to use just a 24mm offset ring spanner to loosen the top strut nut and a 10mm spanner to keep the strut from turning. It took more effort but got the job done. 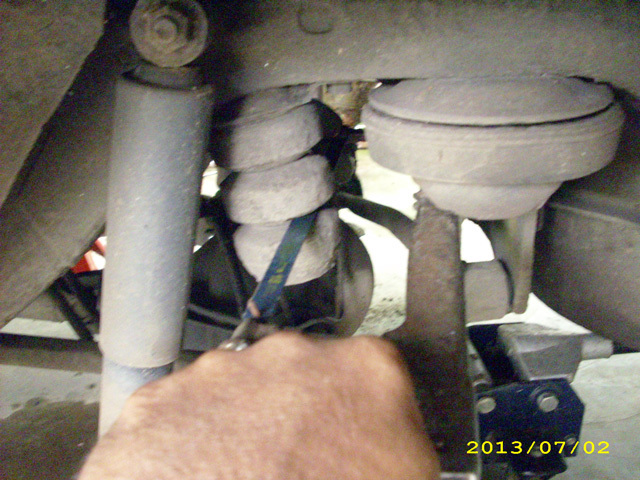 I did not use splitters or pullers either to disconnect the tie-rod ends; instead I used the more “popular” method whacking the steering arm with a hammer. The right-hand side dropped off after three blows but the left-hand side was more stubborn. Pulling the heavy strut assembly was quite a struggle as you had to be careful not to stretch the brake line too much. An extra pair of hands would help a lot. The right side came crashing down to my horror while I was adjusting the floor jack but I was relieved that no visible damage was done to the brake lines. 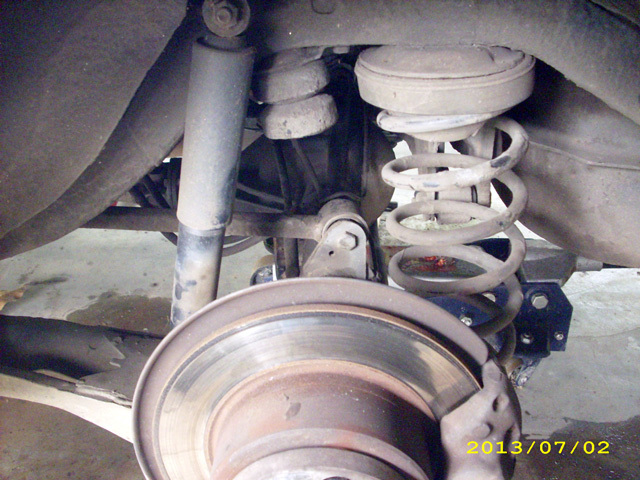 Apart from disconnecting the strut assemblies from the body, the toughest part of the job had to be compressing, decompressing and compressing the springs again. I felt I was turning the compressor nuts forever – 10 turns this side, 10 turns the other side, over and over again. I lost count but Crazychopsticks wrote that it took about 280 half-turns each side! Strut assembly out of wheel well. Two and a half coils of the bottom. 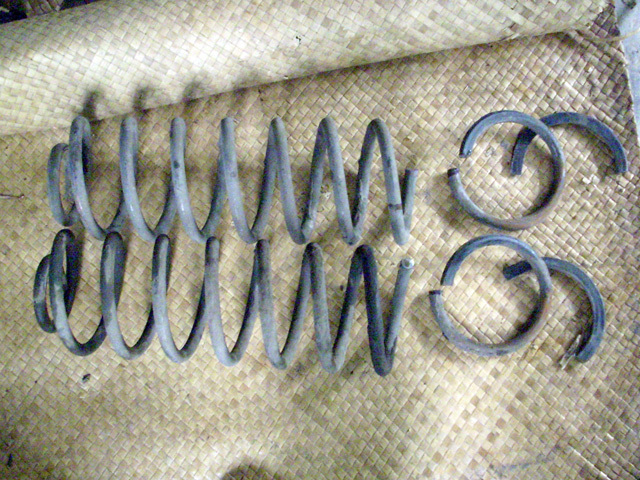 Once the springs were out, I measured carefully two and a half coils from the bottom and marked the spot to be cut. I used a new cut-off wheel on my grinder and later a grinding wheel to blunt out the sharp edges. After the springs were duly chopped, I took the bump stops out from the shock cover and cut a third off them. I used to hear fellow Volvo-nuts complaining of their suspension bottoming out after chopping their springs and I think that happened because they did not cut these hard rubber stopper. By the time I got everything back together on the car, it was already late and I was totally spent. The car sat with an extreme rake as the back springs were still not done. I took the brick out for a quick run and I was liking it already that way. No shakes, no rattles and no apparent misalignment of the wheels. The car was fine but I was feeling the physical stress of an old weekend mechanic. My back hurt, my fingers were stiff and my right knee were swollen. I could not shift my weight on the right leg and were dragging it to walk. One and a half coils off the top. I took Monday off to nurse my bad knee, massaging it with ointment and just loafing around. By Tuesday I was a lot better and could bend the bad knee without flinching, so it was back to work. 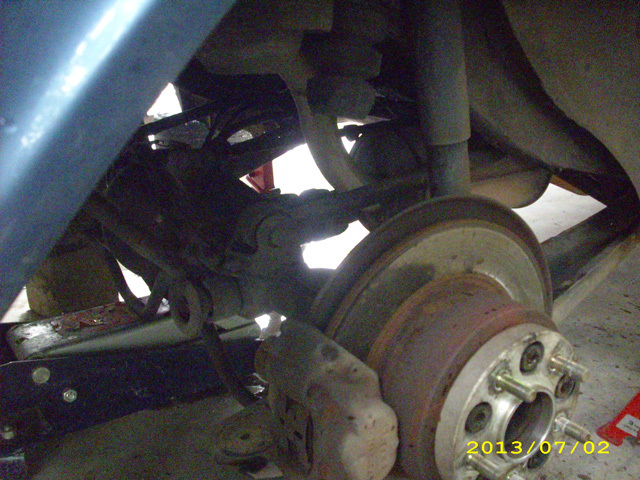 The rear suspension was a lot easier to do as it does not require the dreaded spring compressors. 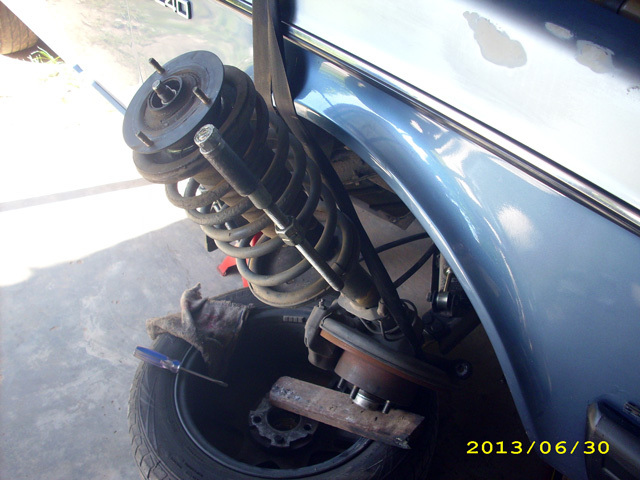 Put the car up on stands, jack the axle up and undo the shocks and the springs. In theory, yes. In my case, the right shock absorber lower connecting bolt would not budge. It took a hammer and a drift to convince the bolt to come out without a fight. The last person who worked on the car had used a bolt with a slightly larger OD that fitted snugly into the mounting holes, so snug I reckon the damper would stay on without a nut. Cutting the rear bump stop. Slammed down in the weeds. 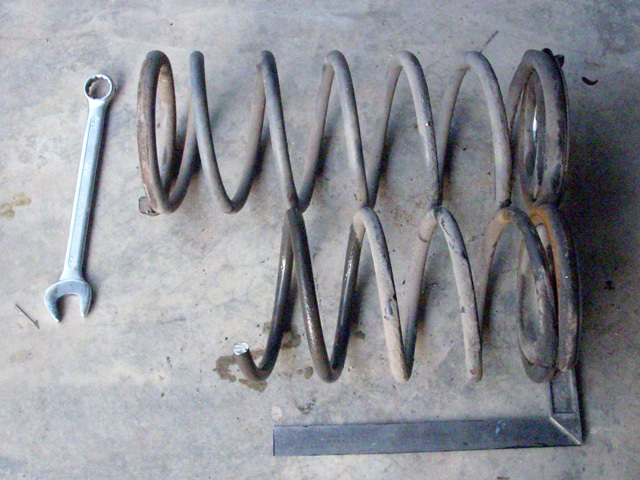 For the rear springs, I cut the top part off as the springs were securely attached to the lower control arms. 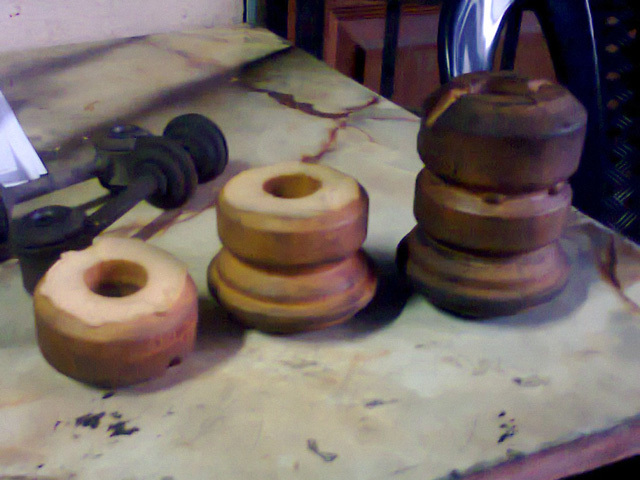 Only one and a half coils were taken off each side and a third off the bump stops as well. 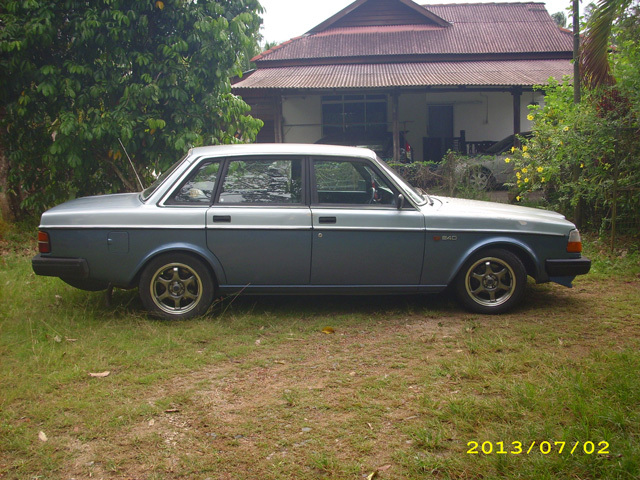 I did not want to slam the rear down too much as the car would also serve as people transporter from time to time. I replaced the odd mounting bolt with a more suitable one found lying around in the workshop and re-installed everything back on the car. Took it off the stands and stood back to admire my work. At first the left side looked a bit higher than the right but after a brisk spin on the uneven rural road, it settled in nicely. The car still has a slight rake due to the tyres. I have 65s at the back and 60s at the front, don’t ask me why. 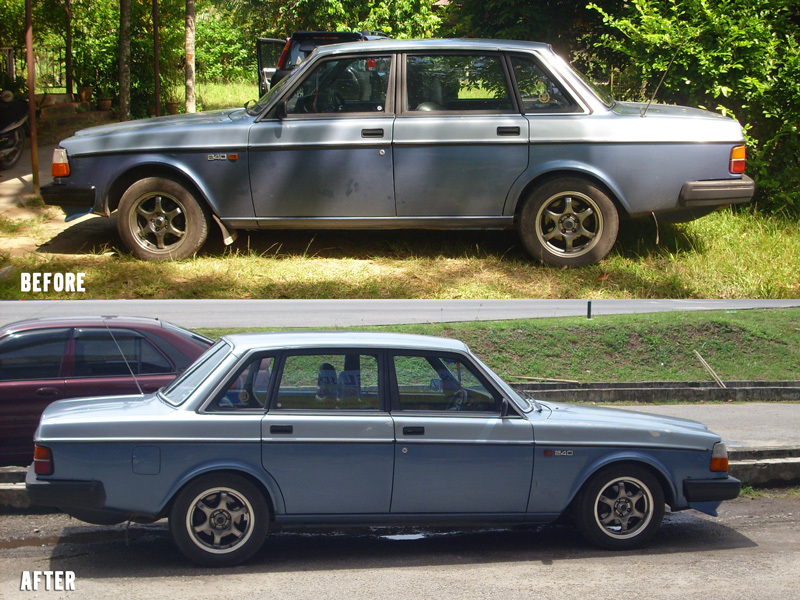 I think it should have the right stance once I can afford new tyres of the same height on all four corners soon. After taking the car to the shop for re-alignment and some camber correction, it drove like a dream. Back from the shop, I was driving and smiling at the same time. And oh yes, I had to watch out for road humps (a.k.a. sleeping policemen) and the potholes. Post-operation update: I must remember to re-aim the headlights as well. As at now, the beams are shining up to about six or seven feet in front of the car. I can see better at night on my 100cc motor-bike! The mud-flaps are also hanging down closer to the pavement. At first I removed them altogether which looked okay but considering that I live in a wet rural area where muddy puddles are common, so I put them back on. The front flaps were moved up one and a half inches while the rear flaps were trimmed one and a quarter inches off the top before being mounted. 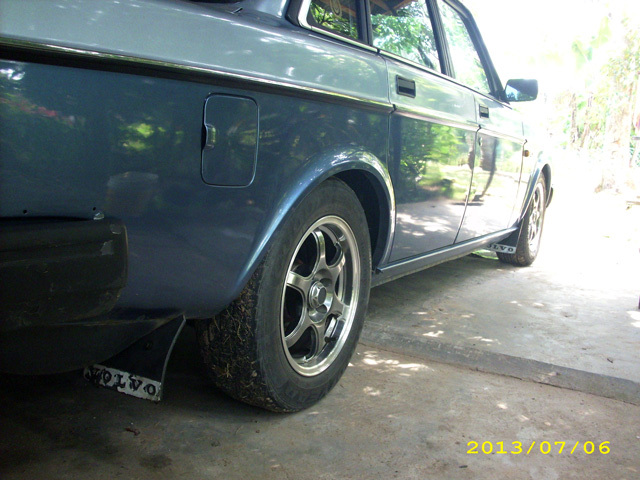 With seven inches ground clearance at the back (and four and a half in front, woo hoo!) I should be able to clear the curbs if I have to reverse park in town areas and still keep the car clean from back sprays. This is probably my [B]ig  [F]reaking [T]errible mistake.